Heading into our round 19, top of the ladder clash with the Sturt Double blues, lets flash back to a historic matchup between the two clubs. It was 1981, the year the first Indiana Jones film, Raiders of the Lost Ark was released, neon clothing was coming into fashion and Trevor Chappell famously and controversially bowled underarm for the final delivery to deny New Zealand the chance to win the one day international match. Meanwhile in the SANFL the Panthers were sitting second on the ladder by round 21 of the season. They had enjoyed a successful '81 campaign up until this point and were facing 5th placed Sturt. The match turned out to be a high scoring affair with South totaling 161 points (including a massive 11.4 second quarter!) to Sturt's 112 by the final siren. Although compared to a couple of other games in the round this was a relatively modest score. Norwood finished their match with 192 points against Centrals and Glenelg kicked a whopping 33 goals to finish with a score of 224 points against Woodville. 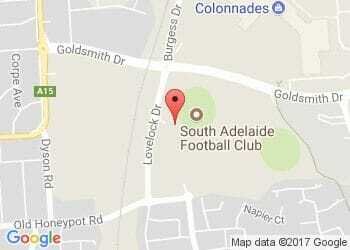 Fun Fact: South Adelaide kicked 39 goals and 16 points in Round 14 of the 1984 season against Woodville. Scoring their highest score in history of 250 points and winning the game by a margin of 122. Back to '81 where South were also dominant at Footy Park and led the game at every break. Check out the highlights from the game here. You may notice the quick and crafty South Adelaide great Mark Naley wearing the #17 blue and white guernsey running amok against the Double Blues. This game was played early in his playing days. Mark made his debut for the South League side in 1980 after winning the reserves premiership in '79. 10 years later, after a short stint and premiership with Carlton in the VFL, Naley returned to South Adelaide and became the clubs 5th Magarey Medalist in '91. Along with the important clash against Sturt this Sunday we also have our Panthers Magarey Medal lunch, if you haven't booked a seat already then make sure you give us a call. Let's hope we see a similar result on the weekend - Fight On Forever!